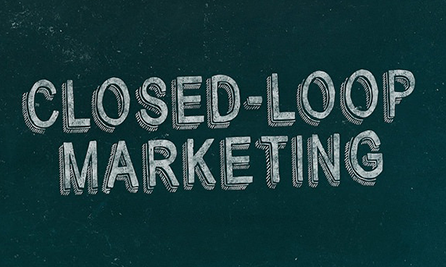 When we say closed-loop we mean tracking sales back to the marketing initiative that created them, thus ‘closing the loop’. To really prove the ROI of your lead sources you need to be able to track every lead, customer and investment back to its origination. Visitor arrives on your site. Visitor converts into a lead. Let’s look into each of these steps in more detail. The best way to close the loop is to direct all lead traffic through your site. When a visitor arrives at your site a cookie is set which refers to their lead source. As this lead moves through your sales cycle the cookie monitors the interactions and you can track the lead back to its original source whether that is email campaigns, organic search, referral traffic, direct traffic, or social media etc. You can analyse the reports to see the value of your sources and improve ones that are underperforming. A tracking URL is used which is created through your marketing automation tool and a unique token is added to the URL showing the campaign source. When a visitor browses your site the cookie tracks the behaviours of your visitors e.g. the pages they view or the content they are interested in. This behaviour analysis helps sales to tailor their follow up later down the line. All of the hard work of behaviour analysis can be done for you using a marketing automation tool. You have directed your incoming traffic to a landing page with a lead-capture form. This lead-capture form typically asks the visitor to provide contact information e.g. their name, company information and contact details etc. Once the form is submitted the visitor is converted into a lead and you collect their information, growing your lead database. Which of your marketing channels provided you with the most customers? How can you optimise your marketing channels? Closed-loop marketing allows you to answer these questions and determine the value of your lead sources. To close the loop you need to look at your sales and track them back to their marketing initiative. The best way to do this is to integrate your marketing tool with your CRM. The purpose of a CRM is to synchronize the activities from your sales, marketing and customer support teams. The purpose of a marketing automation tool is to record your marketing data and learn from the analytics to improve your campaigns and lead conversions. To close the loop you need the two systems to interact, otherwise you just have 2 separate databases. Integration allows the two tools to talk to each other so when a deal is closed as won in the CRM a trigger updates the record in the marketing automation tool. Therefore you can trace the sale back to its marketing initiative. Understanding your sites conversions allows you to identify your most influential pages and content. You can replicate success and improve underperformance. You can implement assignment rules, lead scoring and lead nurturing campaigns that increase the ROI of your marketing initiatives. Integrating marketing automation and CRM helps to align your sales and marketing teams rather than them working as separate entities.